Cauli-Kale-Quinoa now try saying that 10 times fast. But really, this trio (and a few more ingredients) creates the perfect texture for a delicious veggie burger! What is so great about this recipe is that unlike lots of veggie burgers, there are just a few ingredients (Just 6 in the burger) and I baked these in the oven so you don’t have to worry about patties breaking in the pan (the worst!). And the reason I always use a hard bread, like a ciabatta is to get more than just a soft texture, the crispy kale chip also works in this burger too! Lastly, who doesn’t love some garlic sauce, amirite! Also, my first newsletter goes out tomorrow! It’s a complete Kale roundup! the nutrition facts and all the recipes in one place! There is still time to sign up here! You won’t want to miss out! Preheat the oven to 400 degrees. Prepare a baking sheet with parchment paper. Chop cauliflower into florets. Toss in olive oil, salt and pepper, and spread on the baking sheet. Take about 8 large pieces of kale and toss with the cauliflower. Add to the baking sheet. Place the cauliflower and kale in the oven. Check on the kale after 10 minutes and take it out if crispy and set aside. Continue to roast the cauliflower for 20 minutes. Add 1/4 cup dry quinoa and 1/2 cup water to a small pot with a cover. Cook the quinoa until the water dissolves and the quinoa is fluffy. While the quinoa is cooking, Add 1 tsp of olive oil to a skillet and add the cup of kale. Cook for 5-8 minutes until the kale is wilted. Let cool slightly. Take out the cauliflower and leave the oven on. Let the cauliflower, quinoa, and kale cool slightly. Add the cauliflower and wilted kale to a food processor with half a cup of beans and a clove of garlic. Add the mixture to a large bowl. Add the quinoa and crack an egg. Use a fork to mix all the ingredients together. Form the mixture into 4 even patties. Spray the cookie sheet with cooking spray and place the patties on the cooking sheet. Cook in the oven for 20 minutes (mine had a nice browning without flipping or searing in a skillet). While the veggie burgers are cooking, mince 2 cloves of garlic and add to a food processor. Add the yogurt, juice of half a lemon, red wine vinegar. Blend on high. Add salt and pepper to the garlic sauce to taste. Toast the ciabbata. I used a large rectangular loaf and cut it to fit each burger. Assemble the burger with the garlic sauce, avocado, kale chips, and ciabatta. Alternatively, wrap the burgers in butter lettuce. If there is one thing I have learned about veggie burgers, they are not something to mess around with! They are very delicate flowers, that crumble into mush too easily! That being said, this recipe can easily be altered to be dairy free and gluten free. How great is that!? Dairy Free: This recipe has no cheese, if you can’t eat greek yogurt, nix the sauce! mashed avocado works just fine! Gluten-free: The veggie burger is naturally gluten free, just swap the buns for some bibb lettuce, or add it on top of your favorite salad! 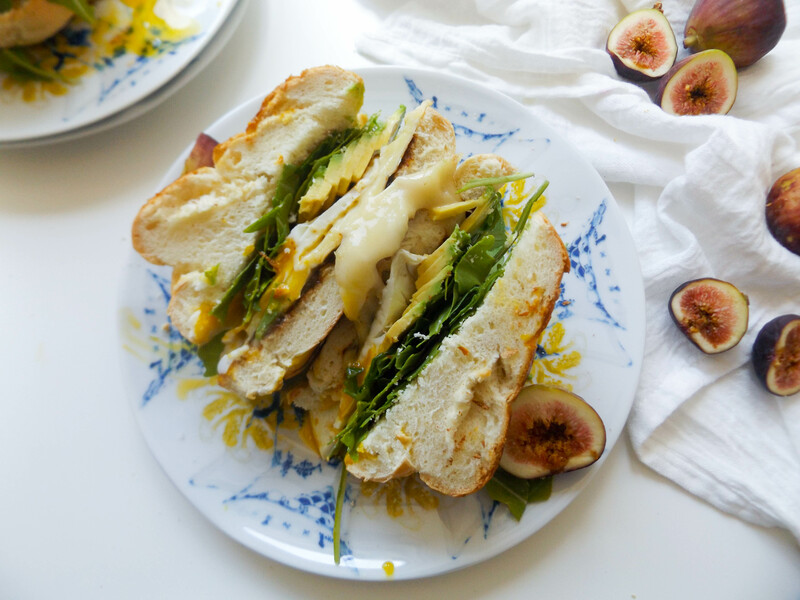 It’s the perfect way to bring this in for lunch #notsaddesklunch here!